SOCIOLOGIST NICKI LISA COLE ’02 CONSIDERS THE ETHICS BEHIND BUYING COFFEE, OFFERS TIPS ON UNDERSTANDING THE VARIOUS LABELS AND—OUCH!—SUGGESTS YOU JUST MIGHT WANT TO CUT BACK ON CONSUMPTION. 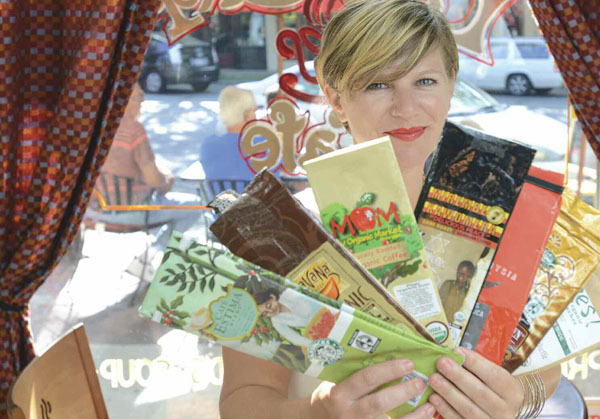 Sociologist Nicki Lisa Cole ’02 carries around an accordion file stuffed with empty, flattened coffee bags she has collected from cafes across the U.S. over the last several years. Each item in her collection, begun when a package of coffee at Starbucks caught her eye, bears imagery or prose that hints at the ethical considerations behind the beans’ journey across the world and into your cup. As the labels pile up, it’s a lot of information for Cole to parse. And so it is for everyday coffee-drinkers as well. With so many coffee-with-a-conscience practices operating—fair trade, direct trade, organic, shade grown, bird friendly—understanding the different approaches to ethically-sourced coffee, each with pros and cons, would seem to require pursuing dissertation-level research on the topic. Cole did just that. She became so fascinated with the messages being sent to consumers about ethically marketed or produced coffee that the issue came to drive her doctoral research. Now a lecturer in sociology at Pomona, Cole writes blog posts (21centurynomad. com) on coffee sourcing that are broadly followed, and her expertise has been sought by The Nation, Conducive Magazine and others. With this hazy awareness, the heart of the matter can get lost. Cole wants to remind us why ethical sourcing for coffee is necessary. The reasons include historically low prices that make life a struggle for small producers, fluctuating prices because coffee is traded on the commodities market and price gouging of small producers by large transnational buyers. So what can coffee drinkers do? No system is perfect, but Cole says ethical coffee practices do, in fact, make some positive differences around the world. And so her one cup of coffee and one double espresso per day is always fair trade or direct trade. “While I have critiques of all the models out there, I always advocate for picking one that resonates with you and going with it, because it’s better than not,” she says. The first step: “Ask about the coffee where you buy it: What are the sourcing practices behind this coffee?” Cole says. The café or coffee shop owner might tell you that they import fair trade certified coffee because they value how the higher price supports community development, or that the certification standards require environmental practices such as minimized use of agrochemicals and water-conserving irrigation systems. Or, you might learn that they happily pay an even higher cost for direct trade coffee (also “relationship coffee”), purchased directly from a grower they trust, as opposed to a cooperative of producers, like in fair trade. And if they clam up? Cole points to the transparency of Portland-based Stumptown Coffee Roasters, which practices the direct-trade approach. “They claim ‘our books are open,’” Cole says. Want to learn exactly what price was paid to what producer practicing what methods? You got it. But even if your coffee vendor provides evidence of ethical sourcing practices, how do you know which system is best? Cole says that depends on what you value. For example, fair trade certification requires a premium be paid on top of the minimum price per pound, which is then used to help workers, farmers and their families through such projects as school improvements, student scholarship provisions or the establishment and maintenance of healthcare clinics. The direct trade model does not provide for this kind of community betterment, according to Cole. On the other hand, Cole notes, the democratic structure of fair trade cooperatives, where leadership constantly rotates, makes it difficult for buyers to nurture long-term, trusting relationships with producers. Since direct-trade buyers work directly with producers instead of cooperatives, it’s possible to cultivate close, symbiotic relationships in which both parties benefit—buyers pay a higher price for the assurance of high quality coffee, which in turn affords growers a higher level of economic stability. Fair Trade U.S.A.officials have defended the move as a way to benefit more farmers and workers, and to allow more consumers to buy Fair Trade products. Cole, though, says there is not nearly enough of a market to support current fair trade coffee production, so adding larger plantations will harm existing fair trade producers. One thing you might be surprised to learn about Cole, considering the depth of her knowledge and the hundreds of coffee shops she’s visited over the years: She is not a voracious coffee drinker. She is definitely a fan, but has reduced her consumption in consideration of the intense physical efforts that go into cultivating, harvesting and processing coffee beans.